After a 127-99 win over the Orlando Magic, the Oklahoma City Thunder are finally at .500, which means they’ve rest the first three months of the season and ready to make the push necessary for them to make the playoffs. Kevin Durant scored 21 points in 28 minutes and Russell Westbrook scored 17 in 24 minutes as the Thunder scored 79 points in the first half, their most since the Supersonics scored 79 in one half 22 years ago. The Thunder took things a lot easier in the second half, but finished with 57.8% from the field, helped by shooting 76% from the field during the second quarter. 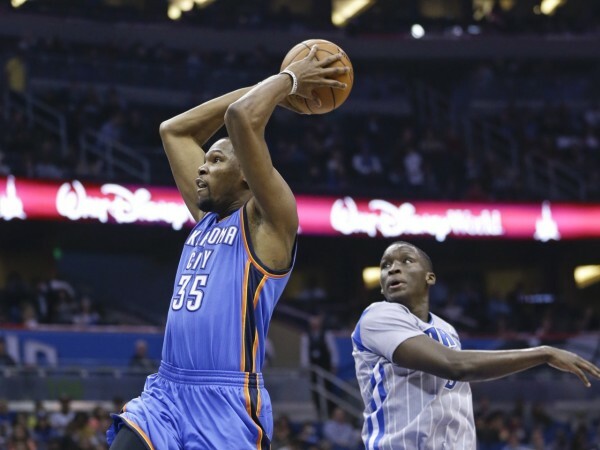 Durant was two assists shy of a triple double, grabbing 11 rebounds in the game. Durant and Westbrook also picked up technical fouls, the 10th this season for Westbrook and a third for Durant. Their attitude and tendency to argue with officials doesn’t seem to change, despite (At least Durant) saying they know they need to work on it. The better they get, the more entitled and arrogant their attitude is on the floor. As long as it doesn’t hurt the Thunder, which it doesn’t on most nights, it doesn’t really matter. The Thunder are still three games behind the Suns for the 8th spot in the Western conference, and will need to start doing better on the road in order to close that gap. They’re only 8 out of 21 this season when playing away from home. The game in Orlando was the first of a five-game road trip in the East, which includes playing in Miami, Washington, Atlanta and Cleveland before heading back home to face the Timberwolves. The return of Kevin Durant in December has certainly taken this team back into contention, something Russell Westbrook probably wouldn’t have been able to do on his own. His return from his second absence hasn’t been so successful, with the Thunder winning five of eight games since December 31, and going 1-3 on the road.